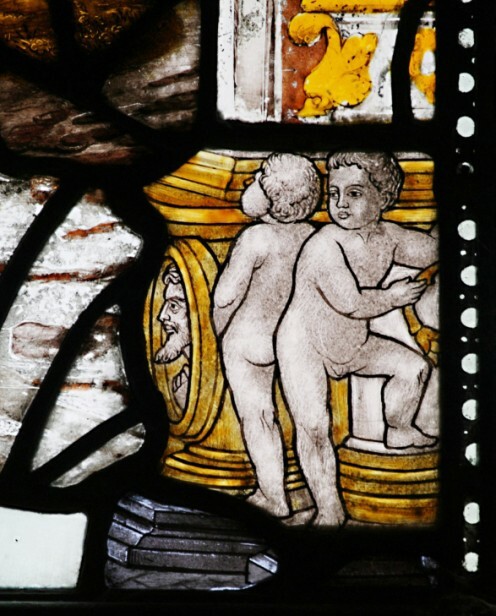 Compared to England very little has been published about medieval and renaissance stained glass in South Wales – the traditional counties of Monmouthshire (Gwent), Glamorgan, Carmarthenshire and Pembrokeshire. This month Vidimus is delighted to rectify those omissions by publishing Andrew Renton’s groundbreaking survey of an area that he knows well. It will be an invaluable asset for future scholars. Fig. 2. The Miles ap Harri window, St Eata church, Atcham. Ap Harri had married Joan, a niece of William Herbert of Raglan, 1st Earl of Pembroke, whose own intentions for a commemorative scheme of windows were to be frustrated. In his will he asked to be buried in the Priory Church at Abergavenny and gave money for windows to be provided ‘Glazed with the stories of the passion of Christ and of the Nativity and of the Saints of mine that be in my Clozett at Ragland’. Following his execution in 1469 after the battle of Edgecote, however, he was buried at Tintern and the Abergavenny windows left unrealised. 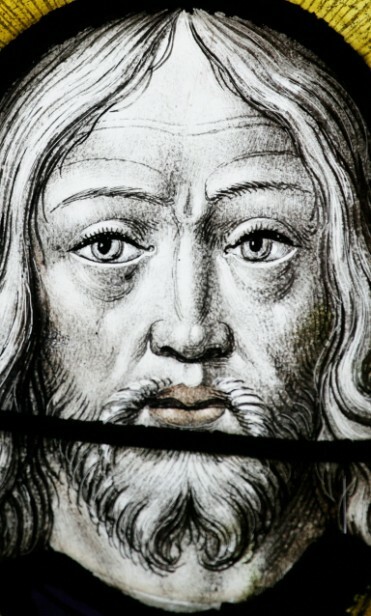 There is some documentary evidence that stained glass had a significant presence in south Wales in the Middle Ages. A little out of the region, at the remote Cistercian abbey of Strata Florida in Ceredigion, the poet Guto ap Siencyn relates that Abbot Rhys (c1436–41) built a fine room ‘with glass windows’, while his successor Morgan ap Rhys (1444–86) earned the praise of poet Dafydd Nanmor when he restored the choir and ‘cut ten complete windows, half the cost of this went in glass.’ In 1478 the medieval topographer William Worcestre visited Tintern Abbey and described its east window glazed with the arms of the abbey’s major benefactor, Roger Bigod, 5th earl of Norfolk (1245–1306). 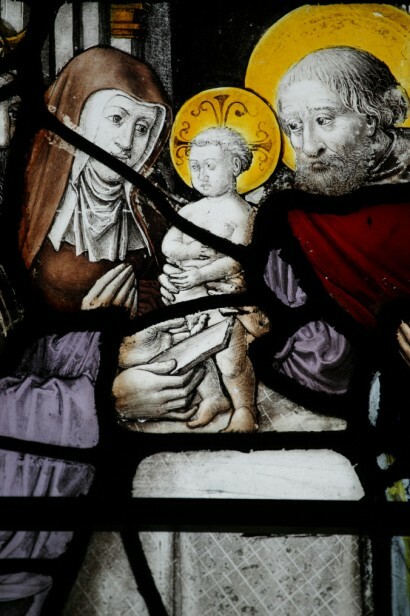 In 1504 the Cistercian monks of Llantarnam and Neath each received a bequest of £10 from David Mathew of St Fagans towards glazing the west window of their abbey churches. 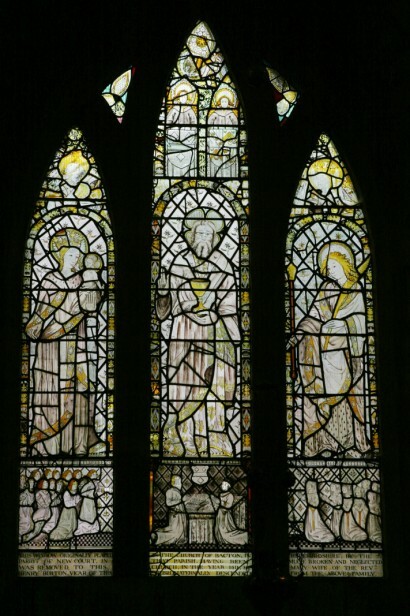 The windows at Neath were soon to be celebrated in a celebrated awdl of about 1520 by the poet Lewys Morgannwg (fl. 1520–65), dedicated to Lleision ap Tomas (fl. 1513–1541), the last abbot of Neath. Morgannwg praises the abbey as ‘a palace comparable to the temple of Solomon’, ‘the admiration of England, the lamp of France and Ireland’, noting how ‘every colour is seen in the crystal windows, every fair and high-wrought form beams forth through them like the rays of the sun … Imperial arms distinctly may be seen on the glass’. 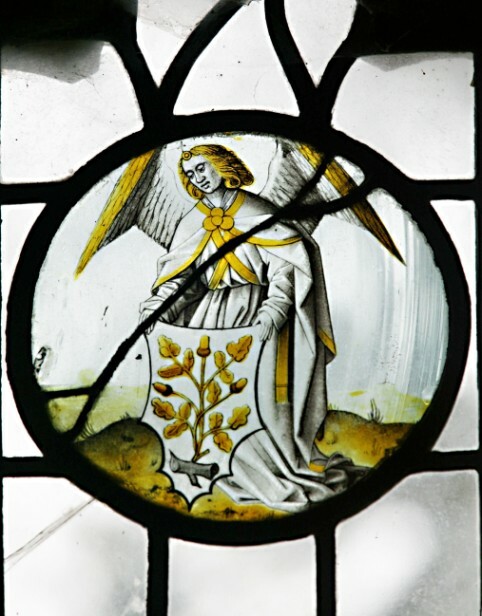 These armorial windows survived at least in part until 1684, when the antiquarian Thomas Dineley (d.1695) noted them during his journey through Wales with the Duke of Beaufort and reported that armorial bearings were often repeated in the old painted glass and in the stonework. 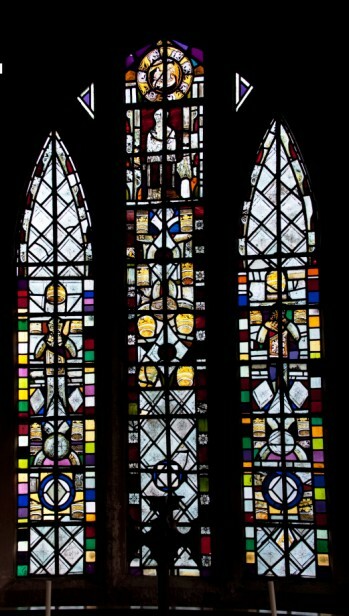 It is impossible to say exactly how much stained glass had been lost to iconoclastic destruction by this date, but the smashing of the windows of St David’s cathedral in 1648 at the hands of Cromwellian troops must stand as probably the most regrettable of many more acts of destruction across the region. Fig. 3. Painted angel at St Teilo © National Museum, Wales. It is probably reasonable to infer from the example of this relatively modest church that a fair number of other churches in medieval south Wales were glazed, not least those like St Mary’s in Haverfordwest, of evident architectural ambition. 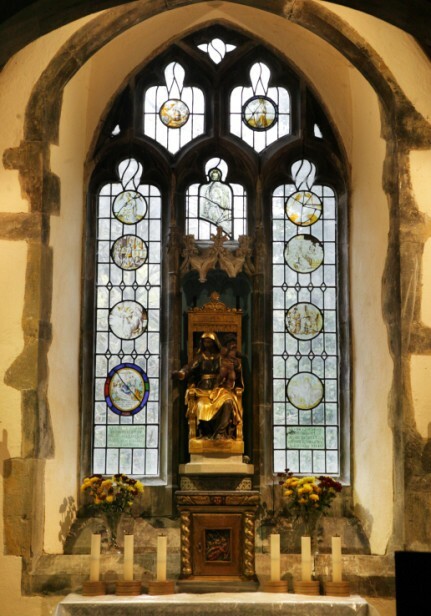 More important secular buildings are also likely to have had some stained glass windows, to judge from the late fifteenth-century great hall at St Donat’s Castle, where the three-light window in the dais bay has a top row of shield-shaped lights, no doubt intended for armorial stained glass. Archaeological evidence comes chiefly from monastic sites. Fragments of early coloured glass discovered during architect S.W. Williams’s excavations at the ruined Cistercian abbey at Strata Florida between 1887 and 1890 are now held at Ceredigion Museum, Aberystwyth. In Cardiff, excavations at the Greyfriars site commissioned by the 3rd Marquess of Bute in the 1890s and the 4th Marquess in the 1920s produced thirteenth- and fourteenth-century grisaille painted glass, a range of patterns that included animals and birds, fleur-de-lys and various types of foliage, and a suggestion that the east window may have borne representations of saints. The 3rd Marquess also had the Cardiff Blackfriars site excavated in the 1880s, revealing similar types of glass, as well as some early sixteenth-century coloured fragments. Excavated glass from the Cardiff Greyfriars and Blackfriars excavations is now held by the department of Archaeology & Numismatics at the National Museum, Cardiff. Fig . 4. 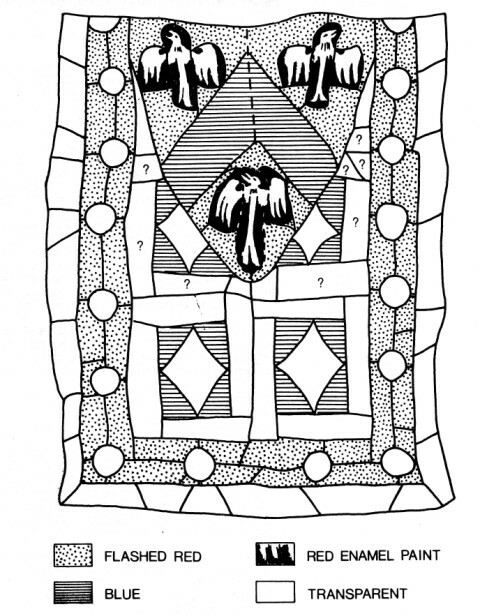 Reconstruction drawing of the late fourteenth-century armorial panel excavated from Carmarthen Greyfriars. Of glass that survives in situ, most comprises fragments reused in nineteenth-century restorations. 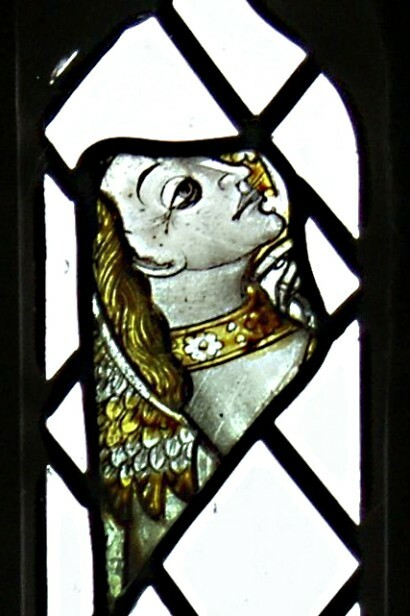 This holds true from St Davids Cathedral in the far west, where medieval glass has been brought together in a window in the north aisle, as far as St Andrew’s at Presteigne on the England-Radnorshire border (stretching the definition of south Wales to the limit), whose Lady Chapel exhibits a jumble of early fifteenth-century pieces. The majority, perhaps not surprisingly, congregates in Monmouthshire in the east of the region, historically more prosperous and most influenced by the west and south west of England. Very occasionally coherent panels survive, but these have been removed from their original contexts and it is impossible to be certain whether they were created for buildings in south Wales or have come from further afield. The house Great Cil-lwch at Llantilio Crossenny has a small late fifteenth-century figure of St George of good quality. This may have come from the local church of St Teilo, which enjoyed the patronage of the medieval bishops of Llandaff. 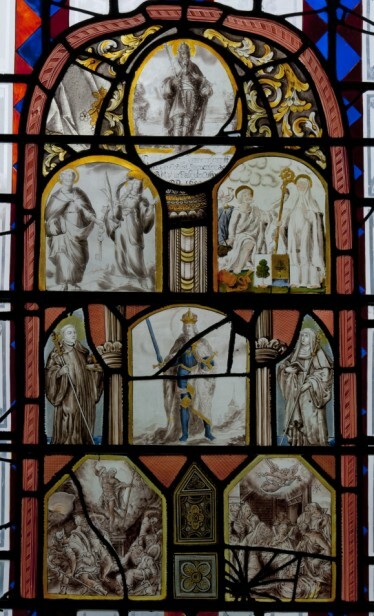 In the north aisle of St David’s Priory, Swansea, is a window containing a fifteenth-century Resurrection, with Christ holding a cross as he steps from the tomb over the sleeping soldiers. Given to the church in 1847 by local historian George Grant Francis, the panel is thought likely to have originated in Devon. The second site of interest is the Catholic chapel of St Mary and St Michael built at Llanarth Court near Abergavenny in the late eighteenth century for John Jones. Five windows on the north side contain German glass of exceptionally fine quality. Three show half-figures of Salvator Mundi, St John the Evangelist and St James, all from the same series and attributed to a Cologne workshop of about 1510–20; another window showing the Circumcision of Christ dates from c.1522–26. 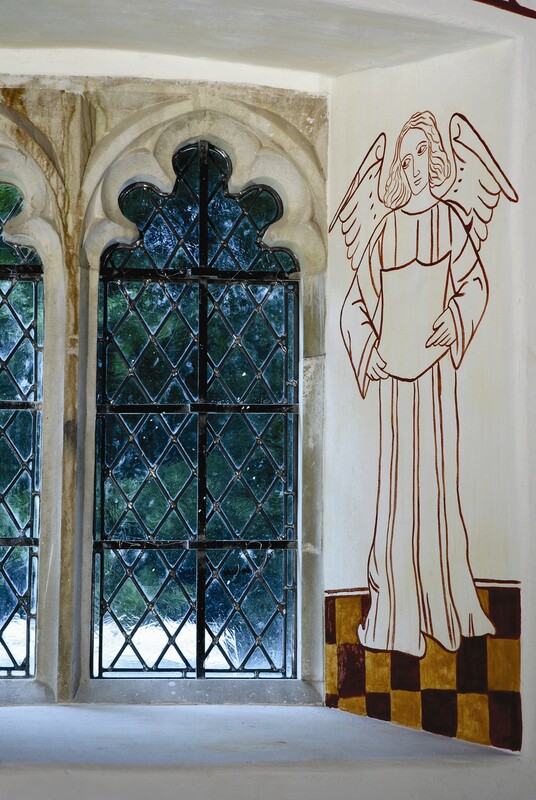 The windows have been likened to glass of a similar date painted for the cloisters of Steinfeld abbey. Research is ongoing. A fifth window contains an arrangement of typical seventeenth-century Swiss or German grisaille roundels, one of them dated 1650 and inscribed as a gift of Lord Heinrich Immendorpff [Figs. 6 and 7]. Other introductions took place in the 1950s. In a window in the south wall of Llandaff Cathedral, adjacent to the font, there are seven small panels of seventeenth-century glass painted with animals, birds and plants. These came originally from Hale Hall in Lancashire, and were installed in Llandaff by the Friends of the cathedral in 1955 as a memorial to Dean D.J. Jones. At about the same time the York architect George Pace, who was responsible for post-war renovations at Llandaff Cathedral, inserted seven sixteenth-century Flemish roundels into the windows of the restored mid thirteenth-century chapter house. 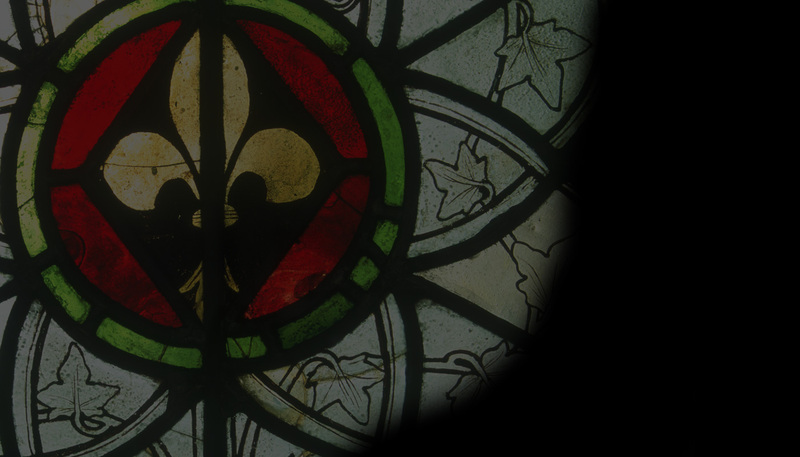 In 1956 Pace also inserted pre-1700 glass into the east window he designed for St Bridget’s, St Brides-super-Ely, which is currently the only pre-Reformation stained glass to be found in the Vale of Glamorgan. The three-light Perpendicular window itself came to St Bridget’s from the nearby chapel of Llanfair Fawr at St-y-Nyll when this was demolished in 1849. Pace set ten roundels and one small panel of fourteenth- to sixteenth-century glass into a clear background, the subjects ranging from St William of York to angels with shields, Salome dancing, the beheading of John the Baptist, Tobias and the Angel, the return of Tobias, the Descent from the Cross and the Resurrection. A particularly unusual scene shows an angel and a devil battling for a man’s soul. (Editor: see this month’s Name that Roundel puzzle). St Davids Cathedral: Medieval fragments in the rim of one window in the north aisle. Fig. 9. Angel with shield decorated with acorns. Glynneath, St Cadoc (Aberpergwm church): Four figurative panels from Steinfeld Abbey in the east window, inserted about 1837–40. Llandaff Cathedral: Seven small seventeenth-century painted panels from Hale Hall, Lancashire, inserted in the south wall in 1955; seven sixteenth-century Flemish roundels, inserted in the chapter house during the 1950s. Swansea, St David’s Priory: A fifteenth-century Resurrection panel in a north aisle window, given in 1847 and probably from Devon. Great Cil-lwch, Llantilio Crossenny: A late fifteenth-century figure of St George, probably from elsewhere. Llanfair Kilgedden, St Mary the Virgin: Medieval fragments including saints’ heads, pinnacles, roses and a lily in the north window of the chancel, a creation perhaps associated with J.D. Sedding’s reconstruction of 1873–76. Fig. 11. Fragment from Llangattock Lingoed. Llangwm Uchaf, St Jerome: Early sixteenth-century fragments in the Perpendicular south window of the nave, including a Tudor rose and a golden pomegranate. Mamilhad, St Illtyd: Medieval glass has been reused in the east window of the chancel at St Illtyd’s, Mamhilad, part of a Crucifixion by Saunders dated 1869. Mathern, St Tewdric: The west window of the south aisle is filled with late fifteenth-century fragments that may have been assembled there during restoration work in the 1880s. Mathern was the site of one of the three medieval palaces of the bishops of Llandaff, which explains why some of the numerous fragmentary armorial panels are associated with John Marshall, bishop of Llandaff 1478–96, who substantially enlarged the thirteenth-century church. Fig. 12. East window, Skenfrith © Michael Woodward. Andrew Renton is Head of Applied Art at National Museum, Wales. •Dineley, T., The Account of The Official Progress of His Grace Henry the First Duke of Beaufort through Wales in 1684 , London, 1888. •Lord, P., The Visual Culture of Wales: Medieval Vision, Cardiff: University of Wales, 2003.